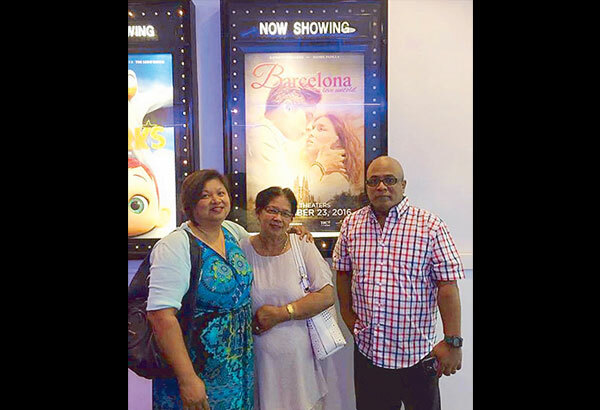 MANILA, Philippines – Star Cinema’s megahit drama Barcelona: A Love Untold came to select US theaters just in time when many Filipinos here needed a respite from all the unfortunate and unpleasant news coming from Manila. It also came days after I decided to take a break from watching the nightly newscast of killings, political scandals and diplomatic controversies back home that leave many US Pinoys appalled or baffled. We caught Barcelona in one of the theaters in the Hudson Mall in Jersey City (New Jersey) following a birthday celebration at a nearby hibachi grill hosted by nurse couple Alfred and Marie Fe Aldana for Marie Fe’s mom, Marina Pansoy. It was Marie Fe who invited me to join them in seeing the much-talked-about film megged by Olivia Lamasan. It was a full house, too, on a Sunday. Marie Fe and Alfred, both from Pangasinan and now living in Jersey City, were actually LizQuen fanatics having faithfully followed the teleseryes Forevermore and Dolce Amore on The Filipino Channel. The couple is enamored by Liza Soberano’s “out of this world” classic beauty that, Alfred says, could eclipse even Hollywood’s leading ladies. But Marie Fe couldn’t resist watching Barcelona after she was enthralled by Daniel Padilla, whom she saw in person at ASAP Live in New York staged days earlier at Barclay Center in Brooklyn, New York. “Lalaking-lalaki ang dating, talagang guwapo at muy simpatico,” was how Marie Fe described the superstar actor also known as ABS-CBN’s Teen King. She shelled out $450 for three tickets just to get a glimpse of Liza in the flesh, as well as Coco Martin and his young sidekick Onyok from their other favorite teleserye, FPJ’s Ang Probinsyano. But, lo and behold, Marie Fe and Alfred now consider themselves KathNiel fans as well after falling in love with Barcelona and its lead stars. Alfred added, “The directing and cinematography are superb, and all the characters are well-acted.” Alfred also gushed about the movie’s theme song, I’ll Never Love This Way Again, an original by Dionne Warwick and sung by Gary Valenciano for the film. For two hours, even I forgot my life’s own drama. Our group, along with the rest of the moviegoers, laughed, smiled, cried, sniffled and reminisced, while marveling at the majestic scenery of the famed Spanish city known for its art, architecture, paella and the humongous basilica Sagrada Familia, which I likened to a giant alien spaceship when I first saw it up close not too long ago. Barcelona, the movie depicts the struggles and loneliness of Pinoy migrants and Overseas Filipino Workers (OFWs) in a moving (and sensitive) manner amid a picturesque backdrop that you can only hope would help ease the pains of the characters. It may lack the depth of films like Milan (also by Lamasan), Dubai (by Rory B. Quintos) or the classic Nora Aunor-starrer ‘Merika (by Gil Portes), but Barcelona has its own strengths and appeal, most notably in the acting department. Daniel’s subdued but intense performance elevated his status from a teen idol into a mature leading man. He is consistent and in total control of his character Ely, a tormented man who is hiding behind a wall of toughness until that facade crumbles and reveals his inner self. It won’t be a surprise if Daniel scores acting nods in next year’s awards derby and it won’t be long till he joins the league of Piolo Pascual, Jericho Rosales, John Lloyd Cruz and Coco. Kathryn, on the other hand, didn’t allow herself to be outshined. As Mia, who is running away from a personal failure and in search of atonement to make her family proud again, she delivered her best performance to date that may also merit acting citations. The scene where (spoiler alert!) she considers taking her own life in a Barcelona subway station was too powerful to forget. Kathryn’s character is actually the heart of the film. A crybaby but nonetheless tenacious despite failures and rejections, she becomes a source of hope and inspiration even to Ely. The camera obviously adores Kathryn (now a grown woman) as every scene and angle managed to highlight her exquisite features, alluring locks and golden brown skin we didn’t get to see in her past projects. Barcelona has a powerhouse cast of notable thespians, with Aiko Melendez and Joshua Garcia (as mother and son dealing with their own issues) deserving special mentions. Aiko hasn’t lost her acting chops that we first noticed in the 1994 big-screen version of Maalaala Mo Kaya (another Lamasan opus) and the 1993 drama May Minamahal (directed by Jose Javier Reyes). She simply steals every scene she’s in without really trying. Still lovely with a much slimmer figure, she only gets better and better in the acting department. Joshua, meanwhile, exhibits so much promise we saw in a young John Lloyd. Brilliant both in comedy and drama and blessed with leading-man looks, he’s undoubtedly on his way for the big time. Barcelona is not without its flaws and the ending is too cheesy to our taste. But no one is complaining. In fact, our friends from Los Angeles, Las Vegas and Virginia shared that audiences in their cities even applauded at the end of the movie. Star Cinema and the cast and crew not only made millions of KathNiel fans very happy and attracted new recruits to the large KathNiel cult, it also managed to deliver an inspiring drama/love story for many overseas Filipinos wanting to escape, however briefly it may be, from life’s troubles.